How was it possible for the Eternal Divine Being to enter into human manifestation as the Ruchira Avatar, Adi Da Samraj? 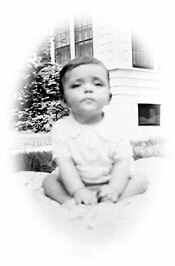 By what mysterious Process did His human Birth occur, sixty-four years ago on Long Island, New York? From His early childhood, Beloved Adi Da described this Process in two words — the "Bright" and the "Thumbs". From His early years, the "Bright" — His Prior Condition of Divine Light — literally "Pressed" Itself into His infant body in waves of Force Descending from infinitely above His head. This intense Force would engorge His throat with a gagging sensation. It felt — as He said — "like a gigantic mass of thumbs". Fevers and delirium would sometimes accompany the onset of the "Thumbs" as His young body struggled to adapt to the overwhelming Infusion of the "Bright". It was a Divine Yogic Event and utter Sacrifice — the "Bright" Combining with the mechanism of a mortal human being.